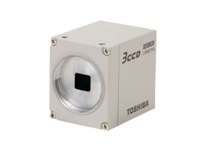 Toshiba'a IK-HD1 Camera System consists of the IK-HD1H Remote Head and the IK-HD1D, IK-HD1E or IK-HD1C Camera Control Units (CCU) and the appropriate camera cables (EXC-HDxx) available in lengths from 3 to 30m. The IK-HD1H Remote Camera Head implements 3x 1/3"" CCD colour sensors and delivers full HD resolution of 1920 x 1080 pixels in 16:9 video format. The remote camera head measures 32.6mm x 38.6mm x 41 mm, weighs 65 grams and is equipped with a C-mount connection. The IK-HD2E CCU carries some new innovative broadcasting features but is otherwise identical to its predecessor IK-HD1E. 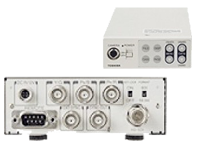 It measures 110 mm x 40 mm x 186 mm and delivers digital HD-SDI (SMPTE 292M) or analogue RGB or YPbPr (swichable) signal.